586,971 ways to win, wild features and free spins: ready for the ultimate gambling quest? Adventure is just a click away in new Holy Diver slots. Big Time Gaming's latest Megaways slot is inspired by Dio's classic album: Holy Diver. And like that album, this game shares a fantastical theme. But even more fantastic are the free spins and guaranteed wild features. 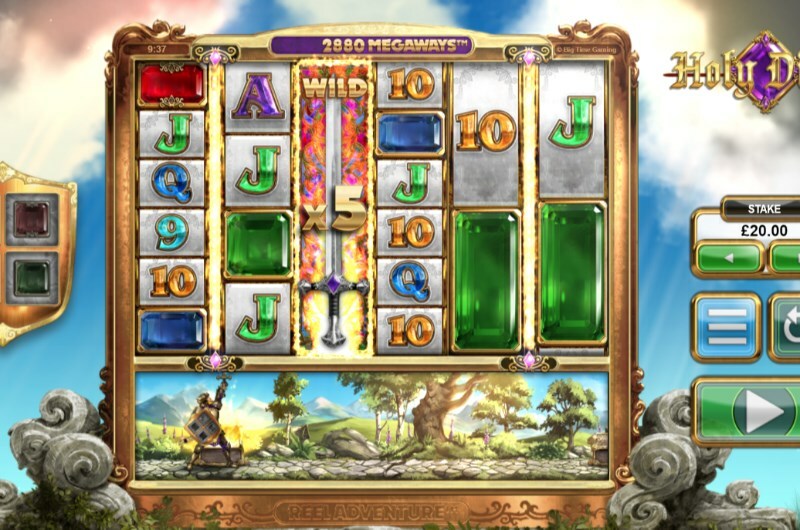 This slot marks the introduction of the new Reel Adventures game mechanic. And this follows the story of a lone knight as he reveals treasures and travels to new lands. It's a quest worth undertaking with huge multiplier wins up for grabs. Fancy your own gambling adventure? Then keep reading for our full Holy Diver Slots first impressions. Before we go into the Holy Diver Slots bonus, we should mention the Megaways feature - made popular by Bonanza slots. 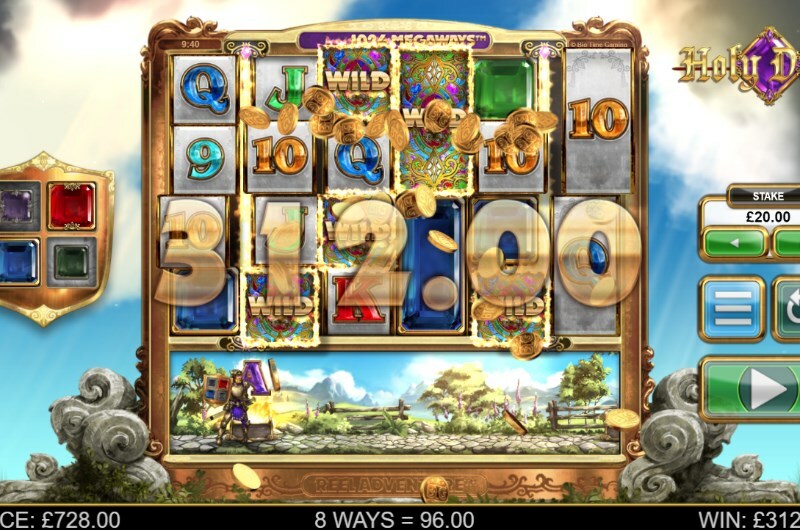 Unlike a fixed ways to win slot - the symbols are always changing size in a Megaways format game. And this means that no two spins are ever the same; one game could have 1000+ ways to win - but the next spin could have 10,000+. In most slots, bonus features activate at random with no discernible warnings. But the Holy Diver Slots feature is far more predictable. In fact, you are guaranteed to activate a bonus feature every 1 - 5 spins. As the knight journeys in his Reel Adventure section of the game, he will come across chests. Opening these chests reveals all sorts of rewards - like multiplier wilds and transforming symbols. As you loot these chests, you may stumble on special gems that slot right into your shield. Collect enough and you can choose to move to the next level for more ways to win. Or you can head straight for the free spins. If you want a better idea of how to play Holy Diver slots, then you can think of it as a video game. You collect the shield gems to advance through the levels until you get to the final stage: the free spins. In this bonus, you are not collecting chests anymore - you are collecting free spins diamonds which award extra free spins. Land five diamonds and you not only unlock 8 extra spins - but you increase the number of symbols available in the game. And finally, it's worth mentioning that you can activate the free spins at any stage of collecting the four gems. But if you hold out to later levels - you can look forward to extra multipliers on the wild card symbols. Holy Diver Slots is one of the freshest new games to come out in a while. The Megaways format is special by itself - but the Reel Adventures feature is even more noteworthy. After all, what slots can guarantee bonus features every 1 to 5 spins? With this in mind, it's easy to recommend this slot - which can be found right now in the Mayfair Casino lobby. Want to learn about the games feature in depth? Then read our Holy Diver Slots Review for more information.